UNITED NATIONS -- A United Nations rights investigator raised concern on Wednesday about whether Myanmar's election next month could be considered free and fair because dozens of candidates had been disqualified and hundreds of thousands of people denied the right to vote. Yanghee Lee, U.N. special rapporteur on rights in Myanmar, also said restrictions on the rights to freedom of expression, assembly and association, including arrests and excessive use of force against protesters, put genuine elections at risk. 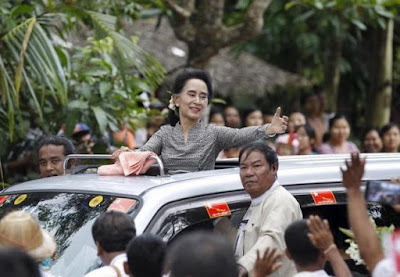 "The credibility of the elections will be judged by the environment in which they are conducted and the extent to which all sectors of Myanmar society have been allowed to freely participate in the political process," Lee wrote in a report she presented to a U.N. General Assembly committee on Wednesday. Myanmar's Nov. 8 poll has been touted as the first free and fair vote in 25 years and a landmark that will determine the pace and scope of democratic reforms that started four years ago when the military stepped back from 49 years in direct power. While Lee acknowledged that reforms over the past four years had "undeniably improved the human rights situation" there were still ongoing rights challenges, including increased intimidation, harassment and surveillance of rights defenders. Myanmar's U.N. Ambassador U Kyaw Tin rejected Lee's report as containing "inaccurate and distorted misleading allegations." "This historic election should not be prejudged by inciting some minor challenges," he said. "Myanmar is doing its best with full commitment to make it free, fair and transparent." Lee said more than 60 candidates, mainly Muslim, had been disqualified from standing for election. Migrant workers, internally displaced people, refugees and Myanmar citizens living abroad potentially cannot vote along with those living in conflict and flood-affected areas, Lee said. She said of most concern was the disenfranchisement of 760,000 people who previously had temporary registration cards. They include people of Chinese and Indian descent but mainly Rohingya in Rakhine State who had the right to vote in the 2010 and 2012 elections. The government denies the Rohingya Muslims citizenship. Hundreds died in clashes between Rohingya Muslims and ethnic Rakhine Buddhists in 2012. Some 140,000 Rohingya live in squalid camps, while thousands more have fled by boat, leading to a regional migration crisis.